Security agencies, with the help of the district police, arrested two Hizbul Mujahedeen terrorists from the Jawali area of Kangra district early this morning. In a rare move, the state High Court today issued directions to the Shimla police to file an affidavit whether any case had been registered in respect of the alleged disorderly conduct during the “Shimla Bandh” on December 10 against the shifting of the District Courts on the call of the District Bar Association. Deputy Commissioner Nandita Gupta has declared two local holidays for the entire district during the next year. She said these holidays would apply to all offices in the district as these would be paid holidays. The Union Ministry of Tribal Affairs has sanctioned the establishment of three “Eklavya model residential schools (EMRS)” in the regions of Bharmour and Pangi in the district. With the elections to the municipal councils and nagar panchayats being held on the party basis, the ruling BJP is facing an uphill task of quelling dissidence in at least five districts where rebel candidates have jumped into the fray. Justifying its demand for a JPC probe into the 2G spectrum scam, the BJP said the credibility of all other institutions, including the CBI and CVC, was under severe doubt and as such the Congress must shun its obstinacy and agree to the demand of Opposition parties. Dissidence emerged at various places in Kangra district on the last day of filing of nomination papers for the elections to five municipal councils. Four panchayats in the tribal Kinnaur district have boycotted polls after people involved in encroachment cases were barred from contesting elections. As many as 1,260 eligible persons were given employment in different departments during a special drive launched to fill the vacancies reserved for special people in the state. The arrested terrorists include Jameel Ahmed, a district commander of Hizbul Mujahedeen from Doda district, and Ghulam Nabi, his assistant, also from the district. A Chinese pistol and eight rounds have been seized from them. They have been remanded into 4-day police custody by judicial magistrate, Jawali. Police sources here said Jameel Ahmed (35) and Ghulam Nabi (20) were allegedly involved in many killing incidents in Jammu and Kashmir. 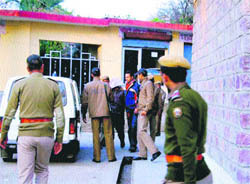 During police interrogation, they had admitted to killing two SPOs in J&K. Jameel Ahmed told the police that he had got training from Pakistan in 1995-96. After returning from Pakistan, he had been active in J&K. Sources said the terrorists were arrested by the police on a tip-off. They had been using the area as their hideout for the past many months. They had been staying in Jawali since November this year. During their stay in Himachal, they had been interacting with their counterparts in J&K on mobile phone. The police sources said further investigation into the case was going on and more information was likely to be extracted from the arrested terrorists. The intelligence agencies have been providing the information to the police that Himachal was being used as a hideout by terrorist organisations from Jammu and Kashmir. Doda district of J&K is adjoining Chamba district of Himachal. Certain areas of Chamba district are very remote. Terrorists from Doda district slip into Himachal when the security agencies step up pressure on them. In the recent past, the Indian Army and the Himachal Police had carried out a combing operation in the areas of Chamba district adjoining Doda. The police has chalked out a list of large number of Pakistan citizens staying in the state for a long time. About 90 Pakistan citizens were staying in Una district of the state adjoining Punjab. Though the list of the persons is available with the security agencies, none has been arrested as yet. The intelligence agencies had detected certain persons using satellite phones to communicate with their links in Jammu and Kashmir. Observing that the holding of a bandh, which interfered in the fundamental rights of the people, was illegal and impermissible, a division bench comprising Chief Justice Kurien Joseph and Justice VK Ahuja directed the state Bar Council to look into the professional or other misconduct of the advocates and whether it had taken any action in the matter. It directed the council to file an affidavit to explain its position in this regard. The court also directed the Registrar-General to forward a copy of the order to all associations in the state so that members of the legal fraternity would get to know the facts and ponder over whether there was any justification at this stage in taking recourse to any agitation against the shifting to the new complex, the construction of which was started in April 2008 and already more than Rs 25 crore had been spent. As many as 21 court rooms had been constructed, which could not be normally used for any other purpose and members of the bar and the public had also been provided with all facilities under one roof. The District Bar Association, Shimla, had submitted a petition before this court in 2007 on which a positive direction was issued in May 2007, which had never been challenged. Also the members of the bar did not have any objection either in 2007 or in 2008 or in 2009. Only when the construction was at the final stage, the matter had been taken to the street. It was fairly clear that the public was not aware of the facts. “Since a very painful and sad impression has been left in the minds of the public regarding the conduct of the advocates, we expect that the media will inform the people of the real background of the issue and the factual position in a truthful manner”, the bench observed. The order was passed on a petition filed by the District Bar Association pleading for either to shift of the non-judicial offices from the existing place or provide a suitable land for the new judicial complex. The notification, which was issued here today, stated that Makar Sakranti on January 14 and concluding day of the state-level “Nalwadi” fair on March 23 would be the two local holidays in the district. The scheme of the EMRS envisages imparting quality education to children of tribal community by creating the best possible infrastructure. As per the revised guidelines on the relaxation of norms for providing land to the EMRS, the state government has been given the option for providing land between 15 to 20 acres so that the proposals can be considered by the Union Ministry of Tribal Affairs. Earlier, there was a condition of providing 20 acres for setting up new EMRS under the scheme. The funds required for setting up of these schools would be released out of allocated grant under Article 275 (1) of the Constitution, an official information said here yesterday. The information said “feeder schools” would be opened one each in the Bharmour and Pangi tribal sub-divisions while one senior secondary school would be set up at a central point which would be located in the environs of the district headquarters town. The process to identify land for these schools was on, the information further said. In these schools, the number of seats for boys and girls would be equal and education entirely free, the information said, adding that every class could have maximum 60 students preferably in 2 sections of 30 students each and the total sanctioned strength of the school would be 480 students. At the higher secondary level of class XI and XII, there would be three sections per class for the three streams in science, commerce and humanities. The maximum sanctioned strength of the each section might be 30 students. In case of shortfall in a section, the scheduled tribal students from other schools may be admitted as per procedure. With today being the last date for nomination for the urban local bodies, senior party leaders have started convincing the rebels who have filed their papers after being denied the party ticket to withdraw from the contest. It is after the December 18, the last date for withdrawal, that a clear picture will emerge. Senior party leadership, including ministers and MLAs concerned, have been assigned the task of pacifying the rebels so that they agree to withdraw their papers. The party’s chances can be marred in several local bodies, including the ones in Chamba, Nurpur, Solan, Dalhousie, Mandi, Hamirpur, Paonta Sahib and Nalagarh in case the rebel candidates do not relent. Senior BJP leader and state convener of the panchayati raj and local bodies election cell H.N. Kashyap said senior party leaders were trying to convince party men who had entered the fray. “I am very confident that most of the BJP men, who have jumped into the fray, will finally withdraw their nominations for which efforts are being made by senior party leaders, he said. Even though the Congress too is faced with a similar situation where several rebels have filed their nominations, but being the party in power, the stakes are very high for the BJP. For them a poor performance will indicate a loss of popular support and a sliding graph which can reflect on the party badly, considering that assembly election will be held in Himachal after two years. The recent spat between state BJP chief Khimi Ram and BJP leader from Kullu Ram Singh has also left the party worrying, especially at such a crucial juncture. No doubt, the FIR has been withdrawn and damage-control done by the party high-ups, including personal intervention by Chief Minister PK Dhumal, but the Congress is bound to rake up the issue to its advantage. An indication to this effect has already been given by HP Congress Committee chief Kaul Singh Thakur, who is trying to project the BJP as anti-Dalit, especially when there is the involvement of the state BJP chief himself. As such, the BJP is trying its level best to win over the rebels so that the party’s chances are not marred in the polls because of infighting. Addressing a press conference here today, national BJP spokesperson Nirmala Sitaraman said the demand for a JPC probe was a legitimate right which most of the political parties, including the BJP, the CPM, the DMK and the NCP, were demanding. “The government is accountable to Parliament and it is only a JPC probe which can summon a minister and get to the truth,” she remarked. Lashing out at the Congress for adopting a very rigid stand on the issue, she said neither they were open to a JPC probe nor willing to state reasons for their reluctance. “The fact that the tainted minister, A. Raja, has very defiantly stated that he had sought the requisite clearances before taking a decision in the 2G spectrum case makes the issue all the more serious,” she said. Sitaraman said the BJP was keen to know from whom had the DMK minister sought permission and it was only the JPC which could summon him and seek details. She added that seeing the scale of the scam, an in-depth investigation into the case was a must in order to get to the truth. The BJP spokesperson was left defenceless when asked about the party joining hands with former Telecommunication Minister Sukh Ram to form a government in Himachal. She avoided a direct reply to the accusation of the BJP having double standards as the Himachal Vikas Congress was its coalition partner to form the government in 1993. As a setback for official nominee of the BJP Varinder Parmar, another prominent leader of the party and former president of the Dharamsala municipal council Kamla Patial today filed nomination papers for the post of president as independent. During the filing of nomination papers, she was also accompanied by a few disgruntled leaders of the BJP. Congress nominee for the post of MC president Subhash Nehria also filed nomination papers today. Sources said though no dissident filed nominations from the Congress, the official nominee was still trying to garner the support of followers of former Congress MLA from Dharamsala Chandresh Kumari. The entry of Kamla Patial into the fray has made the contest for the post of MC president from Dharamsala triangular. From Kangra, Congress nominee Suman Verma, who is also district president, is facing dissidence. The wife of former MLA from Kangra Balkrishan Sharma has filed nomination for the post of president. The post of president of the Kangra municipal council had stayed in family of Balkrishan Sharma for the past about two decades. The BJP has, however, managed to contain dissidence in Kangra. Party candidate Bhawana Gupta will take on the divided Congress in Kangra. From Nagrota, Himadri Sony, another Congress worker, has filed papers as independent. The current president Kuldeep Dhiman has filed nomination papers as independent for the post of vice-president. As the last date for filling nominations for panchayat polls expired, no one from Urni, Chawang, Yula and Meeru panchayats came to file papers for contesting elections. The villagers are protesting the high court’s decision to bar at least 6 lakh persons, involved in 2 lakh cases related to encroachment of government and forest land, from contesting panchayat polls. Stating this while inaugurating the second Floor Hockey National Special Olympics, here today, Chief Minister Prem Kumar Dhumal said all 54,091 persons with over 40 per cent disability had been issued identity cards and 28,867of them were being provided social security pension of Rs 330 per month. Besides free education facility, the physically and mentally challenged persons were also entitled to 3 per cent reservation in government jobs. He said special children were also being given scholarships ranging between Rs 150 to Rs 450 per month (day scholars) and Rs 300 to Rs 900 (hostelers). Dhumal said it was heartening to know that five mentally challenged children from the state had been selected for the Special Olympics to be held in Athens next year. Sports Director, Special Olympics, Victor Vaz said the participation of special sportspersons had doubled and 34 teams were participating. Chairperson of the Special Olympics (Himachal) Mallika Nadda said 12 state-level sports tournaments were organised by the chapter in which 3,070 special children participated. In addition, 850 children participated in national games and national-level camps.